Rome 2007 For the third time, we spent a few days in a European capital. This time we chose Rome, Italy. This third trip was also the longest city trip of the three we made. We stayed for 4 nights in a hotel close to the main train station. But most of the sightseeing sights in Rome are pretty close to one another so that we walked most of the time. We did a LOT of walking though! Unfortunately we had to get up really early as the flight left at 6 am! The flight to Roma only lasts two hours, so we arrived at 8 am. After collecting our baggage we took the Leonardo Express, a train connection between the airport and the main station. Another couple of minutes walking and we arrived at our hotel. Of course our room wasn't ready, so we just deposited our baggage and headed for downtown. First we had a coffe in the bar just across the hotel. We needed that! We went to see the Forum Romanum and the Colosseum. On our way we stopped by the Diocletian thermae and a basilica. History is everywhere in Rome! Although Nicole was a little disappointed since she expected Rome to look like it looked in ancient times. Besides, we are not really used to this kind of heavy traffic, noise and the odor of exhaust fumes. The traffic is not for fearful people! Traffic lights seem to have recommendatory character only. of course during this season, many, many tourists visit the city, so it was crowded everywhere! Still, I enjoyed the sights, and the Colosseum is well worth waiting in line. On our walk back to the hotel, we passed a bookstore and you all know me, I can't just pass one, I have to have a look! Although -who would've guessed- almost all the books were in Italian and I didn't understand a word :. Though, I had Latin in school and I could translate single words - but not really whole sentences. Back at the hotel, we relaxed a little, then went around the corner for dinner, to a small trattoria. The kitchen was in the basement, and the tables stood outside on the street, marked off by a few flower pots. The food was simple, pizza, pasta and some meat, nothing special, but yummy! We had some red wine and then collapsed on our beds! We woke up early - due to traffic noise. Crackling motobikes! These are the only way to arrive at your destination quickly. The breakfast was good, simple, but good. We had it on the deck on top of the hotel in the morning sun - great! Again we prepared for a day on our feet. We went to see the Trevi Fountain, the Pantheon, the Piazza Navona and St. Peter's Basilica in Vatican City. What an impressive sight! Close by the Basilica is the Vatican Museum, which I also wanted to visit, since this is the only way to see the Sistine Chapel with the fresco of Michelangelo. We decided to go there the next day, had some very expensive antipasti in a tourist trap and headed back to the hotel, this time by bus, since our feet and backs really hurt from all the walking. It was cloudy and cooler the next morning. We took the subway to the Vatican Museum and were shocked about the length of the queue. We quickly decided to skip this visit and get up early on our last day, so we just walked a little, visited the Spanish stairway (with hundreds of other tourists and hundreds of flying merchants), bought wine and some snacks and spent the evening on the deck. Ok, we got up early, took the subway to the museum again, arrived there before 9 am and were shocked to see that the queue wasn't much shorter than the day before! But since it was our last day, we stood in line like everyone else. The couple in front of us came from the Kassel area and we talked a while. What we didn't know (our travel guide said differently), that the museum opened at 10 am - once it was open we got in quite quickly. The museum has many different departments, unfortunately some of them were close. I was looking forward to seeing the department of the artefacts that Christian missionaries collected from all over the world, but this was closed. We saw many, many paintings, many, many statues, many, many frescos, many, many tapestries, until we finally arrived in the Sistine Chapel. Photography unfortunately isn't allowed there, it's still used as a chapel, so it is a sacred place. Security does throw you out when you're not quiet or take pictures. It was kind of funny, you hear the murmur of many people, it gets louder, then one of the security guards calls "Silencio! ", it becomes quiet. Then the murmur starts over until the next one calls "Silencio!". The ceiling by Michelangelo is absolutely wonderful. You can read more about it here: Sistine Chapel. 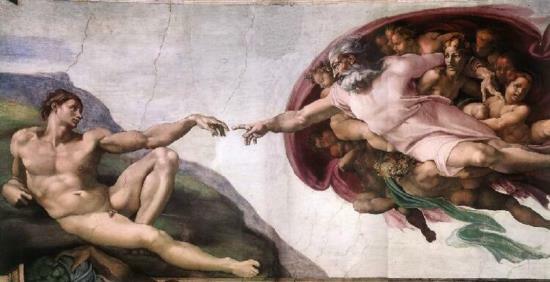 Most famous is the part of the Genesis, where God creates Adam. In the evening we went to a pedestrian area, small alleys with lots of restaurants to have pizza in a very famous (according to our travel guide) place, Pizzeria da Baffetto. It doesn't look spectacular at all, but we really had to wait until we had a table and we had to wait for the pizza as well. Which wasn't bad, since we were seated directly next to the pizza makers, and it was so much fun to watch them create their pizzas. They are really good! That was a great ending to a great trip. The next morning we just packed our bags, had breakfast and headed for the airport to go home.